Big Mineral Marina, known to many as Big Mineral Camp, is a full service recreational resort, marina and campground on Lake Texoma. Whether your stay is for a few hours or several days, you will find yourself in a relaxed atmosphere the whole family can enjoy. 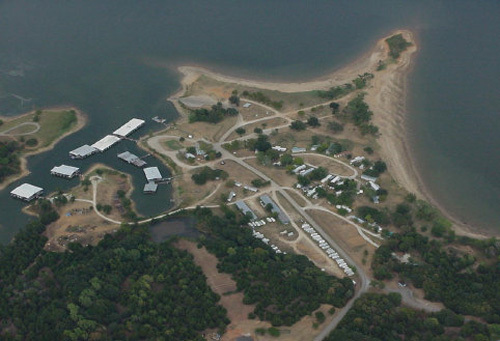 Big Mineral is located near Gordonville, Texas offering double boat ramps, boat slip rentals, dry boat storage, RV storage and gas dock. The convenience store has a snack bar and grill serving breakfast and lunch until 4 pm on Friday and Sunday and until 6 pm on Saturdays during the summer months. The grill is closed after Labor Day and opens back up on May 1st. The friendly staff will help you book a fishing trip with a Lake Texoma professional fishing guide. Rent one or three bedroom fully furnished cabins with full kitchen, bathroom, TV, DVD player and microwave. Over 100 campsites, many with electric hookups, a children’s playground, fishing dock, and group picnic area make roughing it easy. The Big Mineral area has 30 miles of walking, jogging, hiking and equestrian trails. The multi-trail network is managed by the Corps of Engineers and is moderate for physically fit individuals.